November 17 Folk Art Center This is the date of our annual auction to raise money for the club, so no demonstrator has been booked. This is your chance to load up on those tools, wood, or accessories you’ve been wanting at auction prices. 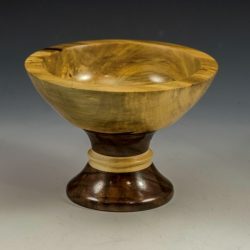 You can bid on a wide variety of items and know that your winning bid will benefit both you and the Carolina Mountain Woodturners. December 15 Folk Art Center Joe Ruminski Joe is one of the treasures of the CMW. Past president of the CMW and Lifetime Membership honoree at the 2016 AAW Symposium are just 2 of his many accolades. Those who know him understand that he is a tireless advocate for woodturning and a consummate teacher and mentor. Watching him demo is both an educational and enlightening experience.